Connect your wireless devices throughout your home. 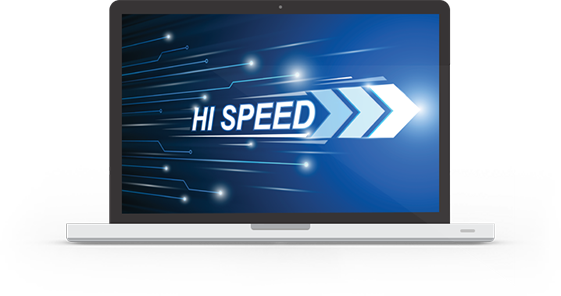 *The HughesNet Gen5 service plans are designed to deliver download speeds of 25 Mbps and upload speeds of 3 Mbps, but individual customers may experience different speeds at different times of the day. Speeds and uninterrupted use are not guaranteed and may vary based on a variety of factors including the configuration of your computer, the number of concurrent users, network or Internet congestion, the capabilities and content of the websites you are accessing, network management practices as deemed necessary, and other factors. When you connect to the HughesNet service using Wi-Fi, your experience will vary based on your proximity to the Wi-Fi source and the strength of the signal. **Streaming is optimized with video streams at DVD quality (up to 480p). For best performance, leave any video streaming applications at their default automatic resolution setting. Most video services are supported. Not all video sources are identifiable. 3 times is based on average HD bit rate of 3.6 Mbps vs. DVD quality at 1.1 Mbps. †If you exceed your monthly plan data, you will experience reduced data speeds until the start of your next billing period. Reduced speeds will typically be in the range of 1 – 3 Mbps and may cause Web sites to load more slowly or affect the performance of certain activities, such as video streaming or large downloads/uploads. HighSpeedInternetProvidersInMyArea is an authorized retailer of Hughes Network Systems, LLC HughesNet is a registered trademark of Hughes Network Systems, LLC, an EchoStar Company.